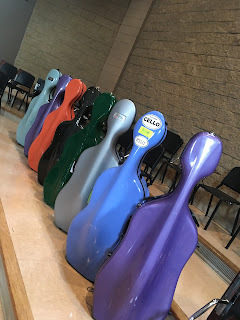 Three of us attended this year's annual Adult Strings Weekend, and it was a great time! To prepare for the weekend, we got the music a few weeks in advance. One of us (thanks, John!) got together recordings of all the pieces, and then we met as a group to play with the recordings. We also got help from our teacher, Laura Usiskin. The weekend was full of kind, enthusiastic musicians of varying levels of experience. The cello section was quite impressive with at least nine players! Big thanks to the organizers, particularly Anne C. Witt, Jane Weigel and student helpers, for making things run so smoothly! There were coffee angels and photo angels and plenty of snacks and good conversation. What lovely musicians making lovely music! And we were in such good hands with resident conductor Joe Lee, whose musical responsibilities include conducting youth orchestras in Huntsville. It was my first time to be part of a chamber orchestra. I LEARNED SO MUCH. Great folks, great weekend! Putting next year's dates Aug. 24-26, 2018 on my calendar. Hope you can join us!